5. Kyle Long, G. Common thought is that Long won’t be available early this season, but should be before long. He’s one of the better guards in the league and never had durability issues before last year. A little lower on this list than he otherwise would’ve been only because I’m not sure on the health of his shoulder. Whether or not that will be an issue is something we’re just going to have to wait and see about. 4. Jerrell Freeman, LB. Was all over the field last year, really adding a speed element to the middle of the defense. Both assignment sure and a good tackler. Also, apparently saved some dude’s life, so he has to be in the top five. 3. 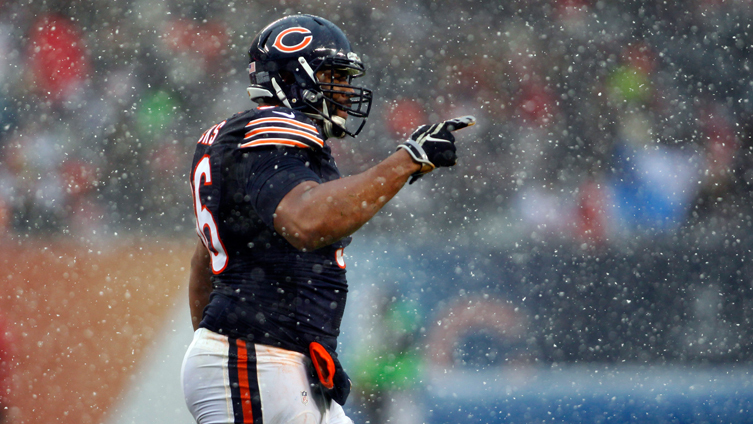 Akiem Hicks, DL. The biggest surprise of the 2016 season for me. I didn’t know he could move as well as he can. A violent rusher who usually delivers a blow when he gets to the quarterback. Probably was the team’s best defensive player last year. You don’t see many 330-pound guys who can get seven sacks. Also had 14 hurries and six hits despite being the only defensive lineman who was worth a damn for most of last year. 2. Josh Sitton, OG. Maybe not as good as he once was, but that only speaks to how good he was then. Allowed just two quarterback hits and five hurries all of last season. Allowed just one more “bad run” than Long did despite playing nearly 300 more snaps. Only real negative is that he was called for six penalties last year; understandable for a guy who was learning the playbook on the fly. 1. Jordan Howard, RB. Here is a list of players who have run for 1,300 yards with an average of five yards per carry since 2010: Jamaal Charles, Marshawn Lynch, Adrian Peterson, LeSean McCoy, Ezekial Elliott and Jordan Howard. Not bad company, huh? It’s been generally thought that Howard had a good rookie season. That’s crazy. He had a GREAT rookie season. The common thought was that he’d be a pounder for the Bears, but he’s so much more than that, proven by his 20 rushes of 20 or more yards, third most in the league. After breaking into the starting lineup in Week Four, Howard averaged 96 rushing yards per game and showed the ability to catch the ball with 29 catches for 298 yards last year. Has great vision and acceleration and finishes every run with a boom. This is the team’s franchise player right now.